I’ve been a blogger for over a year now, and an Instagram influencer for a lot longer, so I’ve compiled this list of nine apps that make my life as a blogger just a little bit easier. Most of these apps are free on the App Store! I will probably be updating this list and adding more apps as I blog more and more! 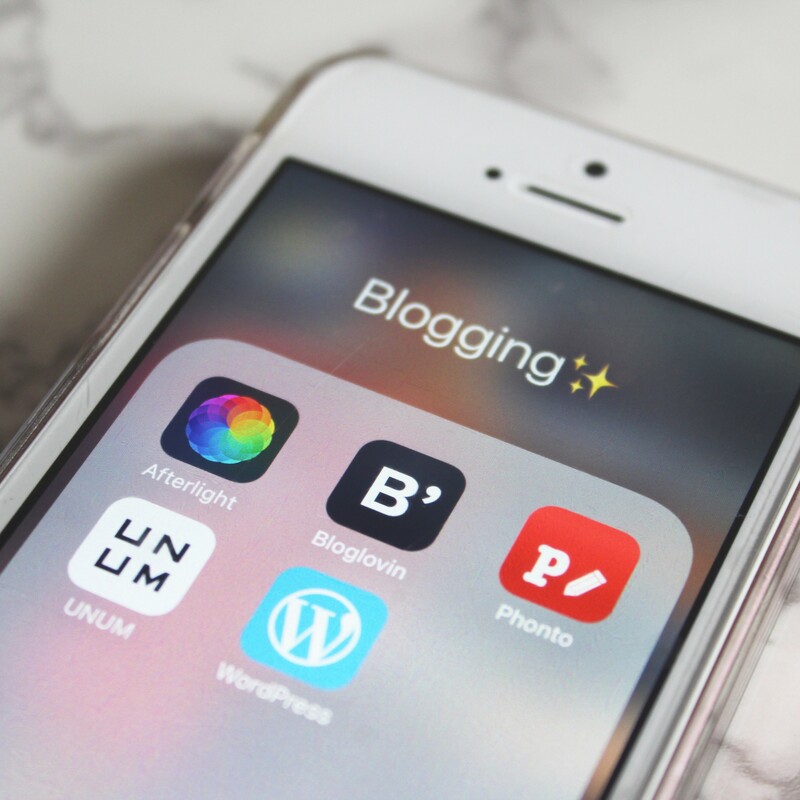 Bloglovin’ (free) This app is a great way to follow all of your favourite blogs and see all of their posts in one feed. I’ve recently started using it as a way to connect with other bloggers across all platforms. Using Bloglovin’ means that it is easier to gain blog followers, as people and bloggers from all platforms can follow you. Instagram (free) Ok, so I’m sure that everyone knows what Instagram is, but there are so many features that benefit bloggers. If your account is a business account, you can use insights to see which of your posts are the most popular, how many website clicks you’ve had, where your audience is from, and more. This means that you don’t need a separate app for analytics. It’s also a great way to promote your blog posts! Twitter (free) Twitter is also an app that so many bloggers use to network and interact with fellow influencers. The best way to do this is to take part in blogger chats or comment swaps, which happen frequently. This means that you can find more people who are interested in your blog! I’ve recently started using it again and I love engaging in chats with other people who are similar to me. Afterlight (£0.99) This is a great app that I have been using for years to edit my photos. I especially like that you can save a combination of filters and effects to use on all of your photos! It also allows you to add borders to your photos or a light leak effect. VSCO (free) This is a pretty standard app for bloggers. Again, it’s an editing app that is useful for choosing filters to brighten up your feed, and keep it consistent if that’s what you want. I can use the same filter to ensure that my feed looks good and all of my pictures have a similar style. Photo (free) This is a pretty basic but extremely useful app that allows you to put text on your images. You can also add photos as well as downloading and importing your own fonts or fonts from the internet. We Heart It (free) So this app is one that I have been using for a very long time. At first I used it to find tumblr style photos and collages of various boy bands, but now I use it to gain inspiration for blog post photos. For example, sometimes I don’t know what type of photo should go with a post topic, so I’d search some keywords and see what comes up. If you don’t have time to take a photo, then you can just use a picture from We Heart It (with credit of course). The website is also very easy to use, but I generally prefer to use the app! UNUM (free) I absolutely love this app! It lets you plan your Instagram feed and rearrange your posts. It is an absolute life saver as you can edit your photos on there as well as plan your captions! It is great for me to see what photo would suit my feed the best and whether it needs to be edited. You can also pay for even more features with a better plan, although I haven’t gotten round to using this yet. Depop (free) This is a good app for everyone, not just bloggers. I use it to sell my unwanted clothes and gifts, as well as buying stuff for a better price! I would say that Depop is great but you have to be careful as there are some scammers on there. Overall, I love using it and it is a good way to make or save money. Comment if you use any of these apps, or if there are any other apps that you use to help you as a blogger! As someone who is new to blogging I found this post really useful as I had never heard of some of these apps – thank you!! I love Afterlight. I would also add Buffer to the list. It’s a free app you can use to schedule tweets, facebook posts and many other things and I find it really useful. Oooh I’ll have to look into that! I use most of these apps not heard of UNUM so need to give this a try, thanks for sharing. This post was really useful for me. Thanks for the information! Any apps for blogging using an iPhone? They don’t have the blogger app anymore boo! This list is really useful, I already use Bloglovin’, Instagram and Twitter but will check out the others. I currently use Canva for creating my blog graphics and Buffer for scheduling my tweets. Want to be the first one to see new content? Subscribe now!